Apparently two viewings of The Nutcracker in one weekend put me in the mood to start my Christmas cards last night. 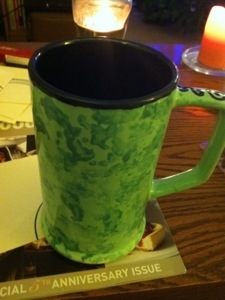 Following a design I found on Pinterest, I used the giant mug I painted at All Fired Up! 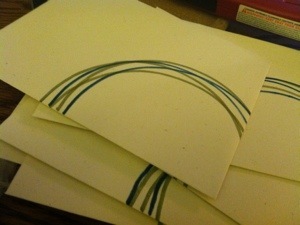 to trace half circles along the bottom right corner of each envelope. Instead of painting the green wreaths on each envelope and waiting for them to dry, I used two green shades of my watercolor markers. I like the way the colors blended together! 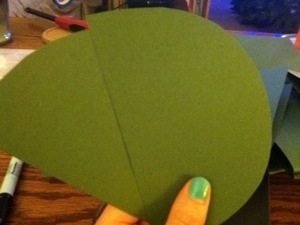 Using the green cardstock I bought at Hollo’s last month, I cut half circles to fold into the Christmas trees for the front of each card. I opened another find on Pinterest to create each tree. Although the folding part was tricky to master based on the photo I found, I kept trying slightly different techniques until I found a method that worked well. 80 paper Christmas trees later, I’m off to a good start! Although that was true two weeks ago, unfortunately, before Thanksgiving fix-ins and family time even entered my mind, now I can justify all the holiday festivities around town, in department stores and on TV. These include my recent obsession with Christmas pinning. I’ve created countless handmade Christmas cards over the years, but I’ve never put much focus on the envelopes – the image my friends and family first see. 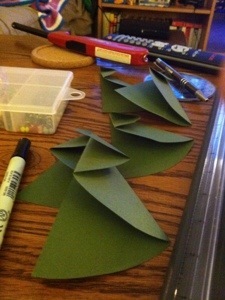 So this year, I’d like to try something new, something I found on Pinterest: Christmas wreath envelopes. I think I’ll write the name of the recipient along the edge of the wreath and possibly substitute the red ribbon bow with a red bow sticker instead. 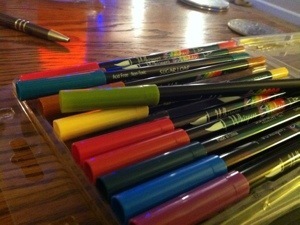 Hoping to start on these this weekend, once I collect some green paints to use!